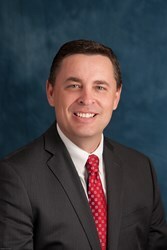 The Frutkin Law Firm, PLC has named Travis S. Williams, Esq. head of the real estate department at the Firm. Williams is a Senior Counsel Attorney with extensive experience in real estate and business law. Prior to joining the Firm, Williams worked for a homebuilder in the Phoenix area, where he focused on real estate acquisition and sales, entitlement, construction, dispute resolution, administrative and environmental compliance, and financing. The experienced attorneys of The Frutkin Law Firm assist in all real estate matters, ranging from securing real estate with a deed of trust to assisting with complex financing, zoning and real estate development projects. This includes purchase and entitlement of raw land, development of residential subdivisions, development and leasing of retail shopping centers, development and leasing of business and professional office space, and development of industrial and storage facilities. For more information on The Frutkin Law Firm and their real estate practice group visit http://www.frutkinlaw.com. With offices in Phoenix and Scottsdale, The Frutkin Law Firm consists of ten attorneys with decades of experience in the core areas of business law, real estate, civil litigation, and estate and tax planning. The Frutkin Law Firm, PLC was founded in 2007 by attorney Jonathan Frutkin with the goal of providing exceptional legal representation to clients throughout Arizona in business and corporate law and related areas, ranging from taxation and asset protection to estate planning. The Frutkin Law Firm helps businesses, individuals, and families in Phoenix and throughout Arizona with their corporate and business law, real estate, taxation, asset protection, wills, trusts, and estates, and litigation needs. The firm has locations in downtown Phoenix and Scottsdale. For more information, visit http://www.frutkinlaw.com.